The SEPA held the First National Soil Pollution Prevention and Control Work Meeting in Beijing on January 8. SEPA Minister Zhou Shengxian was present at and addressed the meeting. He pointed out that we must fully recognize the importance of the work on the prevention and control of soil pollution, step up our efforts, consolidate the work foundation, boost our management level, earnestly address prominent soil environmental problems at present and try all out to create a new situation in this regard. Minister Zhou said, the report of the 17th National Congress of the CPC put forward that we should greatly intensify the prevention and control of water, air and soil pollution and improve urban and rural living environment, which fully demonstrates that the Central Committee of the CPC as well as the State Council have put the prevention and control of soil pollution on high agenda. The reinforcement of the work on the prevention and control of soil pollution is a major measure for the in-depth implementation of scientific outlook on development, a major content in building a new socialist countryside, a main part in establishing the national ecological security system and a crucial guarantee for the realization of quality safety of farm produce. Currently, China faces a stern situation for the prevention and control of soil pollution, some regions are afflicted by serious soil pollution of diversified types with the situation of new and old pollution co-existing and inorganic and organic pollution forming compound pollution. Besides, soil pollution is generated from various sources with complicated underlying reasons and great difficulty for control. The occurrence of incidence regarding the safety of farm produce and human health resulted from soil pollution from time to time has already become a major factor affecting agricultural production, public health and social stability. In this connection, we must fully recognize the protracted nature, arduousness and complicacy of the prevention and control work of soil pollution, further raise our sense of urgency, responsibility and mission, spend more efforts to resolutely put the work onto a more important position and strive to yield effective results. Minister Zhou highlighted that at present and in the near future, the prevention and control work of soil pollution should be closely centered on the overall goal of soil environmental quality betterment, safeguarding the quality safety of farm produce and establishing sound environment for human settlement guided by the gist of the 17th National Congress of the CPC and the scientific outlook on development. We must stick to the basic principles of giving dominance to prevention, combining both prevention and control, advancing in different phases and making penetration in key points to seriously address the outstanding soil environmental problems under the present situation. First, we must properly handle the work of national soil pollution situation survey. Both the national soil pollution situation survey and China Pollution Source Census are major survey over basic national conditions. We must overcome the fear of difficulty, heighten communication and coordination, effectively integrate resources, augment quality management, put supporting fund in place to secure the smooth progress and quality of the survey. We should focus our attention on key regions and contents of the survey to fulfill the overall goal of “getting a clear idea of our basic situation, finding out the underlying reasons and putting forward related countermeasures”. In addition, we should also make active exploration in trans-regional collaboration to support the survey work in regions facing difficulties. Second, we should heighten the environmental supervision and integrated prevention and control of pollution of soil for agricultural cultivation. We should initiate the evaluation of the suitability of basic farmland and the production areas of major farm produce, and put forward suggestions on the adjustment of land use over arable land that are subject to heavy pollution and cannot be restored. We should launch the soil environment safety zoning and monitoring of major pollution sources of the “vegetable basket” bases in major cities and regions. We should perform rigid control over wastewater irrigation and beef up the environmental management of agricultural chemicals including pesticide, fertilizer and herbicide. We should regulate the development of organic food by formulating special management measures, launching pilot and demonstrational projects of the construction of related production bases and incorporating it in the environmental protection special fund both at the central and local level. Third, we should upgrade the environmental supervision of urban construction sites and discarded polluted sites. We should establish the soil environmental access system for land used for urban construction and add the soil environmental status survey system on current construction sites. We should set up the file recording and information management system over urban discarded polluted sites, organize the soil pollution risk assessment and restoration work of enterprises with the premise moved from polluted land sites with relevant departments and lessen the risk of land reuse to human health. Fourth, we should widen the capital investment channel for the prevention and control of soil pollution. We should build up multiple investment mechanism at the national, local and enterprise level to guide social fund to make investment in soil pollution treatment project. Both central and local governments should increase the input in this regard to secure the continued annual growth in related investment. We should promote the integrated treatment of polluted sites by enterprises in principle of “the polluters conduct the treatment, and the investors benefit”. Fifth, we must improve the science and technological supporting capacity for the prevention and control of soil pollution. We should properly carry our the strategic research on soil protection, construct a string of national key laboratories and soil restoration engineering and technological centers on the prevention and control of soil pollution, try all out to conduct the R&D of the restoration technology of polluted soil, develop the restoration facility of polluted soil, actively launch international cooperation and exchange and constantly increase the science and technology level on the prevention and control of soil pollution in China. Sixth, we should establish and amplify the system of laws, regulations and standards on soil environmental protection. We should expedite the research and legislation work on soil pollution prevention and control, lay down relevant policies and measures on tightening the prevention and control of soil pollution, release special administrative measures, and constantly consolidate the system of standards on soil environmental protection. Seventh, we should reinforce the system and capacity building over the supervision of soil environment. We should formulate the national special plan on the prevention and control of soil pollution and properly handle the related implementation work, incorporate soil monitoring in the construction of advanced environmental monitoring and early-warning system as a major content and conduct unified planning and implementation. We should establish and improve the soil environmental quality monitoring network and the plan on soil pollution emergency response at the national, provincial and city level. We should intensify the construction of soil environmental protection working team and upgrade related training efforts. Eighth, we should increase our endeavor in public campaign and education. We should include the prevention and control of soil pollution as a major content in school environmental education and training programs targeting cadres, make full use of the mass media to popularize related scientific knowledge to the public, and guide the people to actively participate in the work of the prevention and control of soil pollution. SEPA Vice Minister Wu Xiaoqing hosted the meeting and delivered the concluding remarks. He pointed out that the proper handling of the work on the prevention and control of soil pollution is the due responsibility of governments at all levels. 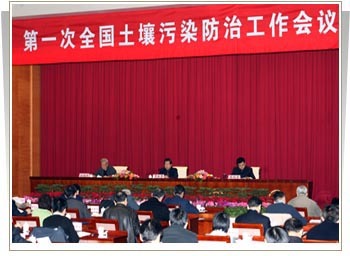 Under the unified leadership of the Party Committee at the same level, environmental protection departments at various levels should earnestly fulfill their responsibility of comprehensive management and supervision over law enforcement, make active coordination with related departments of land, planning, agriculture and finance to seek their support in this regard so as to implement the overall deployment and related policy of the central government and carry out the work in an innovative way by giving due consideration to the specific local conditions. Meanwhile, we should extensively mobilize all social forces to jointly participate in this work. Vice Minister Wu Xiaoqing also made specific arrangement over the key points of the work for the prevention and control of soil pollution for this year as follows: first, we must seriously conduct the national soil pollution situation survey; second, we must earnestly tighten the establishment of the laws, regulations, policies and standards on the prevention and control of soil pollution; third, we should endeavor to improve the scientific supporting capacity for the prevention and control of soil pollution; and fourth, we must concentrate our efforts in doing several major works concerning the prevention and control of soil pollution. Related person in chief from the environmental protection departments of five provinces of Liaoning, Jiangsu, Hunan, Sichuan and Yunnan introduced their experience and practice in conducting soil survey at the meeting. Related officials from the Environment Protection and Resources Conservation Committee of the NPC and the State Auditing Administration, officials from various departments and bureaus of the SEPA, the China Research Academy of Environmental Sciences, China National Environmental Monitoring Center, Sino-Japan Friendship Center for Environmental Protection, Nanjing Institute of Environmental sciences of SEPA, South China Institute of Environmental Sciences and Chinese Academy for Environmental Planning, members of the National Soil Survey Advisory Team and officials from the environmental protection departments (bureaus) of all provinces (autonomous regions or municipalities), sub-provincial city and the Xinjiang Production and Construction Corps attended the meeting.